How many tips does Countess need to reel in this interception? Blake Countess would not be denied this interception. It may have taken the Auburn defensive back three tips to himself but he was ultimately able to reel in the Chad Kelly pass for a turnover. The pick marked Kelly’s 11th interception of the season for the Rebels, something the quarterback really needs to temper if Ole Miss has any chance of holding on to its lead on the SEC West lead. 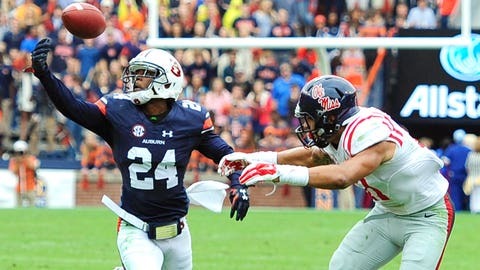 The turnover was Countess’ first interception in an Auburn uniform after taking advantage of the graduate transfer rule over the summer and leaving Michigan. Despite the great play by the Auburn defender, the Tigers fell 27-19 at home to Ole Miss.